Throughout this series, you will begin to see clear patterns with how basic money management works. 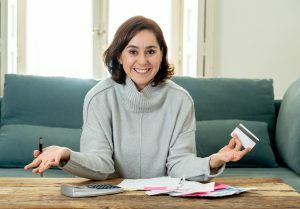 This post focuses on ways to eliminate debt but there are some additional nuggets of information that stand out as well. A clear one is budgeting. 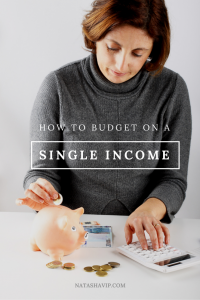 We just discussed budgeting on day one but as the basics of financial wellness comes into focus for you, you will begin to see how this step in your journey is so critical. Before we get into ways to eliminate debt, let’s do sort of an overview of budgeting. This post contains affiliate links at no cost to you. See disclosure page. It’s the second quarter of the year so I reviewed my budget for the first quarter to analyze what’s working and what’s not. One major thing I find is that I still have some work to do in not eating out as much. Raise your hand if you like to cook! (smile) Eating out can absolutely cause you to go into the red because I’ve found it’s cheaper to prepare meals at home. So I can need to definitely reduce the money I’ve set aside in this area and use it somewhere more beneficial. This is something that I will work to do better in this new quarter. I want to point out that I review the prior month’s budget every month and not just once per quarter. However, I do a more robust assessment quarterly. I just need to point this out because I don’t want you thinking you should only review your budgets quarterly. No, that is a monthly activity. With several financial goals set, budgeting is a necessary part of my life. Even knowing this, I admit that it feels constricting and tiresome to do sometimes. I also must admit that I haven’t been consistent in budgeting. If I were, I more than likely would have realized some of my financial goals by now. However, I’m committed to writing out my budget (or typing out my budget as I use a Google spreadsheet) and sticking to it every month. I’m used to making other sacrifices, so I need to stay the course. So, what are some of my financial goals? Well, I have a couple of debts I want to pay off in the coming months. Also, I’m saving for my next car purchase. My car just turned 10 years old! Yippee! I really don’t want another car payment. If I do have one, I plan to have a similar deal as I had for my current vehicle of 10 years ago. And that is to pay 0% interest. Yes, you can do this too and you’re on your way by joining me on this 30-day journey that will turn into a lifetime journey of financial wellness for you. The ideal goal though is to purchase the car fully with cash. I hate loans with a passion, and I certainly don’t want to add to my bill list. We’ll talk about car buying in a post of it’s own but you get my gist. Finally, I am saving to purchase my second home. I am currently a landlord and I’ll also share my story with you about that in a separate post. But I bought my first home at 22 years old. I moved to another state for a career opportunity in 2010 so I’ve rented out my house since then. In terms of saving for these goals, I currently have 8 separate savings accounts that are targeted for each specific area. I save separately for variable expenses, travel, my rental property, for my daughter, and for the big one – emergency fund (another post in this series that’s to come). This works for me so I can see my progress more easily and so I won’t have to try to guess how much money should go towards a particular goal. It’s all done automatically for me! Figure out what works for you and stick with it. 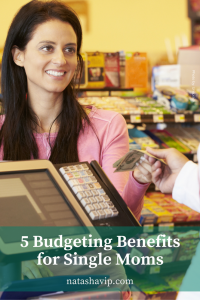 There are several ways to go regarding budgeting, paying off debt, and saving. There is a method out there for you and we will explore some during this series. You might choose one or you might go with a combination of several. Again, it’s all about what works for you and your particular situation. A couple of good people to follow and gain additional financial knowledge from are Suze Orman, Dave Ramsey, and Michelle Singletary. Now let’s get into the main point of this post. 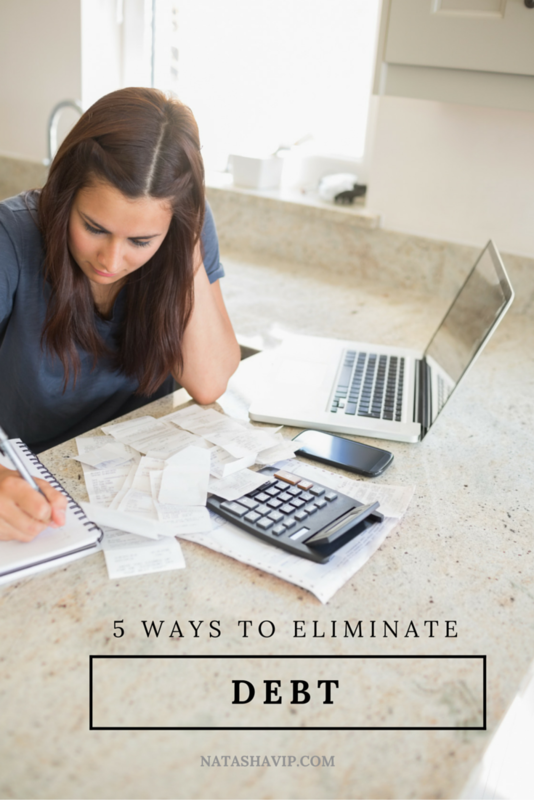 Certainly there are more than 5 ways to eliminate debt but this is to get you started. These are all methods I’ve tried for myself. And again, this is a journey. There is no stopping-point to your finances. You have to be actively involved or nothing will work for you. Stop Spending. If you are living beyond your means, stop now! Nothing can wreck your financial life more than spending above what you can afford. Trust me – you will sleep better at night. Assess your bills and see where you can cut back also. Some things to think about – Do you need all of those cable channels? Should you get a lower cell phone plan? Are you getting the best car or house insurance rates? These are all bills that you may be able to reduce if you make a simple phone call to the companies. They usually give specials throughout the year or to maintain loyal customers. You can eliminate some debt just by sacrificing some of your wants and staying on top of the cost of your needs. Make a Plan. You will go nowhere fast by living your financial life on the fly. Think about and write down some goals you’d like to achieve and put a time-frame to them. Read and study personal finance to get you started. Consult an expert if you have to. Get started and get on the path to financial freedom! Yes, it’s time. Stop putting this off. You’ve been saying how you need to do this but are talking yourself out of it. Get free! Get a peace of mind. You’ll also become better prepared to give to your favorite charities for example (a goal of mine is to start a non-profit foundation). It’s all about the plan! You can eliminate debt by making a plan for your money. Telling your money how to work for you keeps your focused and on track to eliminate debt. Save money. According to some finance experts, you should be saving 10%-20% of your income each month through retirement plans, savings accounts, etc. You can do this. Start small if you have to by saving $25 per paycheck, for example, and increase from there. Put your savings on automatic. Set up your accounts where your bank automatically deducts the funds from your checking account and deposits them into your savings account. Most employers will even allow you to split-deposit your check into separate accounts. With this method, your savings account funds won’t even hit your checking account. Those funds will be deposited directly to your savings account from your paycheck. You can eliminate debt by saving up for what you want to buy instead of putting it on credit cards or being able to pay off the credit card entirely each month. Get Those Interest Rates Reduced. I touched on this somewhat above but you have to be active in your financial life. Don’t just accept what companies offer firsthand. Dig a little deeper and find out what you’re qualified for based on your personal situation. For instance, you may have a credit card right now with a 20% interest rate. If you’re only making minimum payments or low payments on your credit card debt, it will take you probably 30 years to get out of debt at that rate. So not only do I want you to increase your payments to pay that off but while you do have a balance on the card, I want you to call the company today and request to have your interest rate reduced. If that company won’t budge, then consider applying for a card with a lower rate. The ideal action is to pay off the debt as quickly as possible but in the meantime, you need a lower rate in order to gain more steam. I also recognize that having your interest rate reduced can depend on your credit score (we’ll talk about this in a separate post as well). If you have credit issues, we have some tough but doable work to get done. As I stated in day one’s post, this journey will take patience, sacrifice and dedication. You can eliminate debt by knowing what your interest rates are and taking action to have them reduced. Earn Extra Money. You will probably hear me say this often but you have to work with what you have. You are not in debt because of your income. Having said that, there is nothing wrong with earning extra money by starting your own business or getting a second job. As a single mother, I know it can be daunting to think of working another job in addition to your current one especially when childcare is an issue. But think outside of the box on this one. This world is changing and advancing. There are even companies that will allow you to work from home. Did you see my post listing many of them? The ideal thing to do is to start your own business. What is your gift? What do you love to do? How can you turn that into a business? Some questions to ponder. 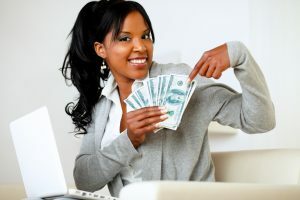 You can eliminate debt by earning extra money. I want you to be careful and pay attention with this however. Make sure you use this money to accelerate your debt payoff and not for anything else unless it’s a true family emergency. We have so much to talk about in this series, and I’m so eager to help you because it’s helping me and holding me accountable as well. Does this post inspire you to take action on eliminating debt? Are you employing any debt payoff methods currently? Excellent really looking forward to this challenge. I’m taking notes! Great Shayla! Keep following along. I have a great plan coming up after the series is complete. Thanks for your support!